Hello Midway Family! 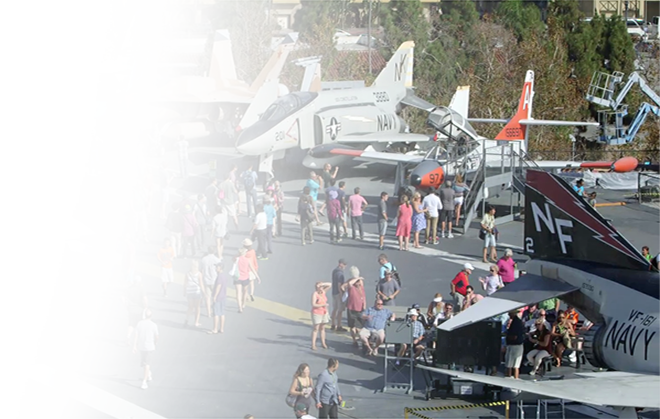 Welcome back to “Karl’s Korner”, a historical segment written by myself, Karl Zingheim – Ship Historian of the USS Midway Museum! 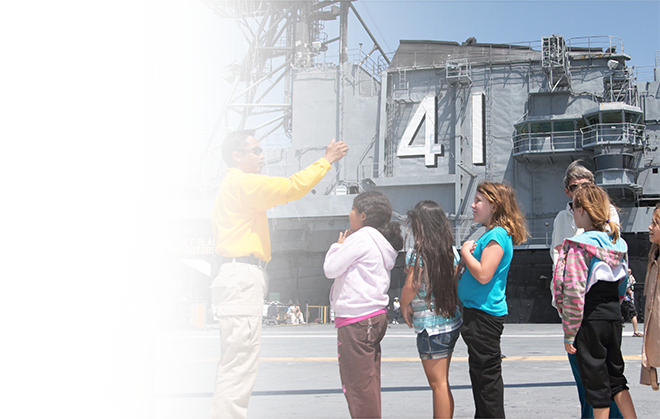 Approaching Labor Day weekends means a day off, a vacation for some – but for us, a means to reflect on jobs onboard Midway! 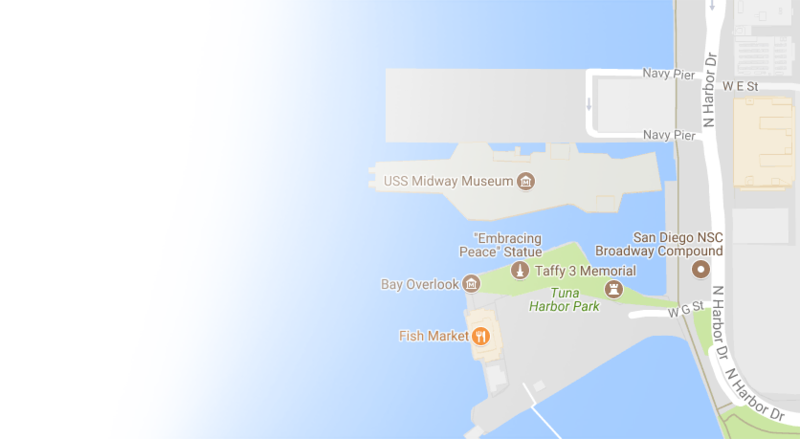 The Midway is often compared to a floating, roving city, crewed by a population of artisans performing jobs that could be likened to a community ashore. 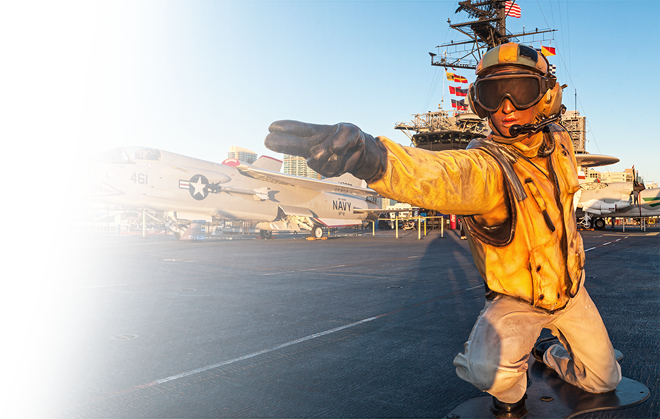 Just as a city has municipal facilities and a coterie of private professions contributing to the vitality of the community, a carrier like the Midway requires thousands of specialists across an impressive spectrum of roles to accomplish her missions. By virtue of operating in the ocean environment, navies are inherently technical, and crewmen, starting from the age of sail were rated on both specialty and competency. After the advent of mechanical propulsion, and later, the proliferation of electronics, the range of recognized professional specialties, or ratings, exploded, and aboard a carrier, nearly every seagoing rating in the Navy can be found. 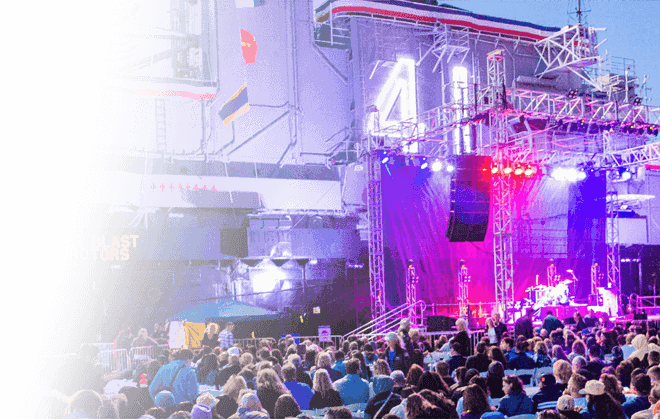 So, what were the ratings found aboard the Midway? The 4,500-man complement was divided among eighteen separate departments, plus the Marine Detachment and the Air Wing. All told, the Midway concluded her long career in 1992 with some 59 different naval ratings represented. Alphabetically, these ratings included Aerographers Mates (AG) making forecasts, Air Traffic Controllers (AC) keeping it sorted overhead, Aviation Anti-Submarine Warfare Technicians (AX) dipping the sonars, Aviation Maintenance Administrationmen (AZ) keeping aircraft records straight, Aviation Boatswains Mate Equipment (ABE) who dealt with catapults and arresting gear, Aviation Boatswains Mate Fuels (ABF) pumping gas, Aviation Boatswains Mate Handling (ABH) who moved aircraft around, Aviation Electricians (AE) fixing aircraft wiring, Aviation Electronics Technicians (AT) keeping avionics working, Aviation Machinists Mates (AD) repairing aircraft engines, Aviation Mechanics Safety Equipment (AME) who maintain ejection seats, Aviation Mechanics Hydraulics (AMH) setting the brakes, Aviation Mechanics Structural (AMS) repairing airframes, Aviation Ordnancemen (AO) loading bombs and bullets, Aviation Storekeepers (AK) who provide aircraft parts, Aviation Support Equipment Technician (AS) working on the flight deck vehicles, Aviation Warfare Systems Operators (AW) finding subs, Boatswains Mates (BM) dropping anchor, and Boiler Technicians (BT) getting steamed. The specialties continue with Cryptologic Technicians (CT) keeping secrets, Damage Controlmen (DC) extinguishing fires, Data Processing Technicians (DP) working computer systems, Data Systems Technicians (DS) fixing computer systems, Dentalmen (DN) assisting the dental officers, Disbursing Clerks (DK) counting cash, Electicians Mates (EM) staying current, Electronics Technicians (ET) fixing radios, Enginemen (EN) tending the diesels, Electronic Warfare Technicians (EW) jamming, Fire Controlmen (FC) taking aim, Journalists (JO) working in media presentation, Gunners Mate Guns (GMG) locking and loading, Gunners Mate Missiles (GMM) blasting off, Hospitalmen (HM) in the Sick Bay, Hull Technicians (HT) fixing the plumbing, Instrumentmen (IM) kept on ticking, Internal Communications Electricians (IC) keeping the telephones working, Intelligence Specialists (IS) piecing it together, Legalmen (LN) booking miscreants, Lithographers (LI) who produced print documentation, Machinery Repairmen (MR) running the machine shops, Machinists Mates (MM) operating the engines, Masters at Arms (MA) walking the beat, Mess Management Specialists (MS) for food service, Navy Counselors (NC) conducting career guidance, Operations Specialists (OS) keeping scope, Religious Program Specialists (RP) assisting the chaplains, Parachute Riggers (PR) who pack the chutes, Personnelmen (PN) handling enlisted service records, Photographers Mates (PH) taking pictures, Postal Clerks (PC), Quartermasters (QM) marking navigation charts, Radiomen (RM) tuning in, Ships Servicemen (SH) cut hair and cleaned laundry, Signalmen (SM) waving flags, Storekeepers (SK) keeping stock, Torpedomen (TM) getting the drop on subs, Weapons Technicians (WT) tending special bombs, and finally, the Yeomen (YN) writing it all down. The Navy abolished or merged some of these ratings in the years after the Midway’s decommissioning, but this large degree of variation in recognized job fields places the nature of the “city-at-sea” in perspective. Very much like a metropolis, the Midway required a crew of officers and highly skilled enlisted personnel to accomplish her missions, and they all could take pride in their achievements over a 47-year career. On that note, enjoy your holiday weekend and thank you for reading! Please share and leave me a comment below if you enjoyed this Karl’s Korner post- and be sure leave any other topics you’d like to know more about! 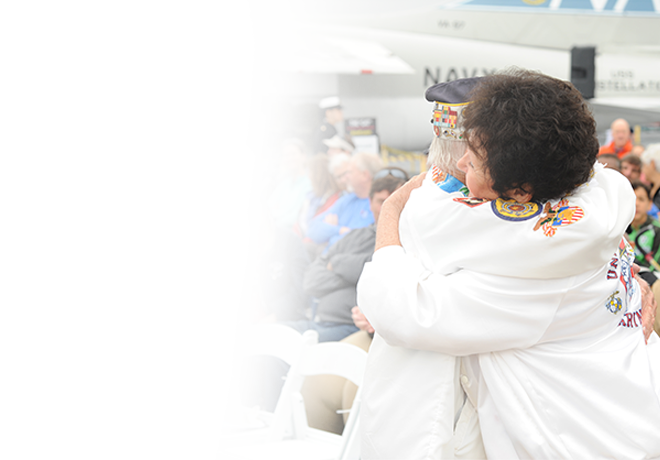 If you are a former Midway Sailor, leave us a comment below with the years you served and your rating. Thanks for reading!